Silky sparkling sheen. Excellent for hot oil treatments. Capture a superior, sparkling sheen with Isoplus Hair Polisher. Its light weight, easy-to-use formula protects against greasy buildup. Leaves hair silky soft and smooth. Excellent as a hot oil treatment. Light weight, easy to use formula protects against greasy build-up. Leaves hair silky soft. Excellent as a hot oil treatment. Prior to styling, pour a small amount of Isoplus Hair Polisher into palm of hands. Rub hands together and spread evenly throughout hair from roots to ends. 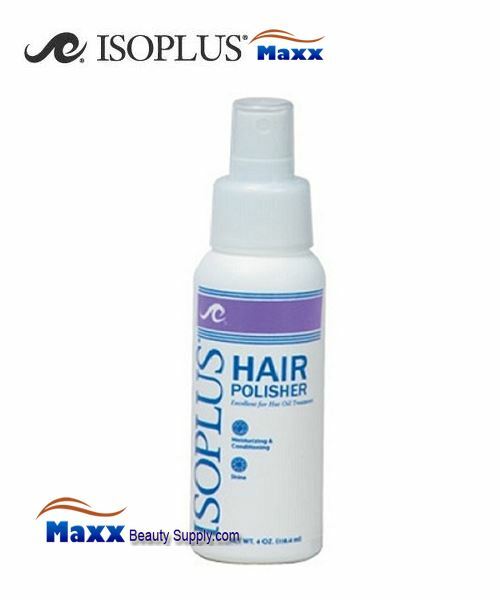 For use as a hot oil treatment, after shampooing, apply Isoplus Hair Polisher sparingly to hair & scalp. Leave in for 10 minutes under dryer, then rinse.